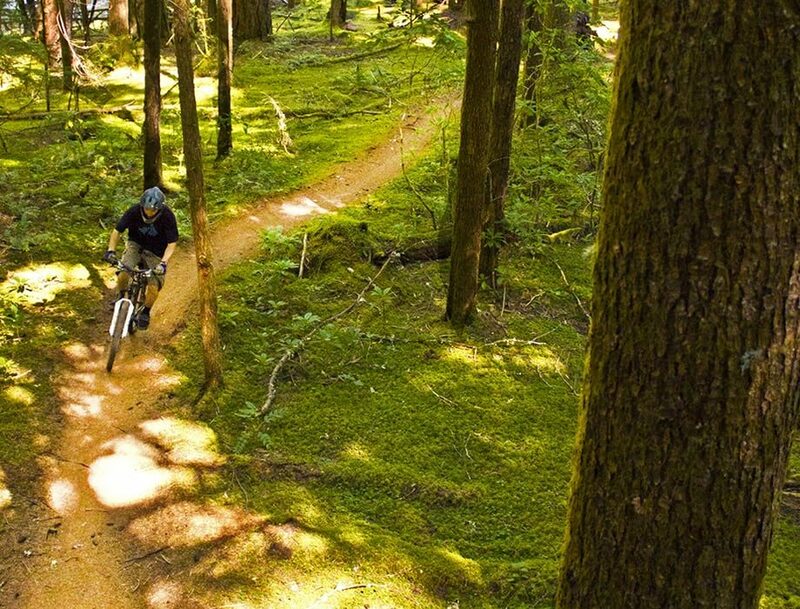 Twenty-six miles along one of Oregon’s most pristine rivers in one of Oregon’s most pristine forests, the McKenzie River Trail #3507 is home to some of the best mountain biking in the west. A variable trail with ancient lava beds, waterfalls and an old-growth forest, the terrain is as exciting as the ride itself. Having once hiked the trail, I had always wanted to return with a bike. A good friend and I recently ventured the three hours south of Portland to the small town of McKenzie Bridge for a marathon on two wheels. Those who know the trail often refer to it as one of the most beautiful spots in the country to ride. Sometimes called America’s #1 Trail, you’ll often find runners, riders and walkers along the trail who have traveled far from home. As I pulled into the parking lot at 8:30am on a Saturday morning, I found two riders from San Jose, California and Seattle, Washington preparing their gear for the one-way shuttle to Clear Lake, where the trail begins. The cool water of the lake contrasted by the heat of the lava fields left me reaching for my bottle of water. After biking around the eastern side of the lake, we headed down to Sahalie Falls. Here is where the McKenzie River first makes its powerful presence known, gushing out of Clear Lake, over the falls, and turning to head downstream. The river finally pools up at Carmen Reservoir, then disappears underground. For a couple of miles the sound of the river disappears until it springs back up at Tamolitch Pool from an underground aquifer. From Tamolitch Pool, you head into the first part of the old-growth forest, where 300-year-old trees line the trail as if to pridefully remind you of its National Forest status. 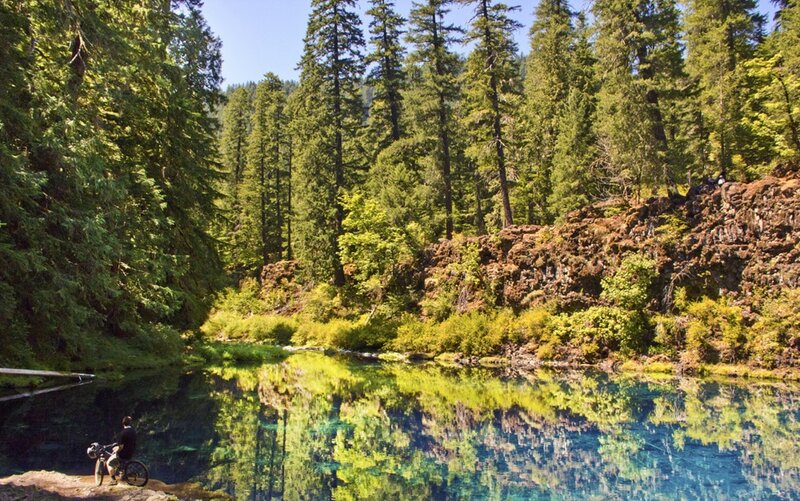 If you are headed to the Willamette National Forest, make the time to visit Tamolitch Pool, one of the most unique geological spots around. A few miles after this natural wonder, you reach Trailbridge Reservoir, where the trail becomes substantially easier. From here, you ride along the river across a number of bridges and enjoy the rest of your ride next to the sound of the rolling river. Those seeking a shorter, less technical ride will find this lower section of the trail to be much easier, while those looking for a more advanced ride should start at Clear Lake. As with so many adventures, sightseeing is part of the event and was an integral part of my ride. To have such accessible mountain biking, trail running and hiking in these amazing places is what makes living and traveling in Oregon so inspiring. Take the time to visit Oregon’s Trail #3507 and make sure to bring your camera! Editor’s note: This is the second post in a seven-part series; read about Connor’s other favorite Oregon adventures here. Connor O’Brien is a Portland- based, second-generation photographer specializing in Adventure Sports, Outdoor Lifestyle and Assignment & Editorial Photography. Having lived in places as far reaching as Australia and as close to home as Massachusetts, Texas, Wisconsin and Minnesota, he has used the varying landscape and the people as inspiration in his photographs. Moving to Oregon many moons ago, Connor has been fortunate enough to experience some of the unspoiled beauties of the west with his camera in hand. 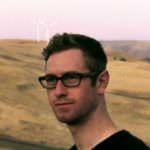 Beginning his career as a freelance writer and photographer in Oregon, he continues to visually describe the landscape he visits throughout his work. Whether it be capturing new ascents on remote crags or following trails down lost canyons, his love and passion for the outdoors has led his photographic development to where it is today.